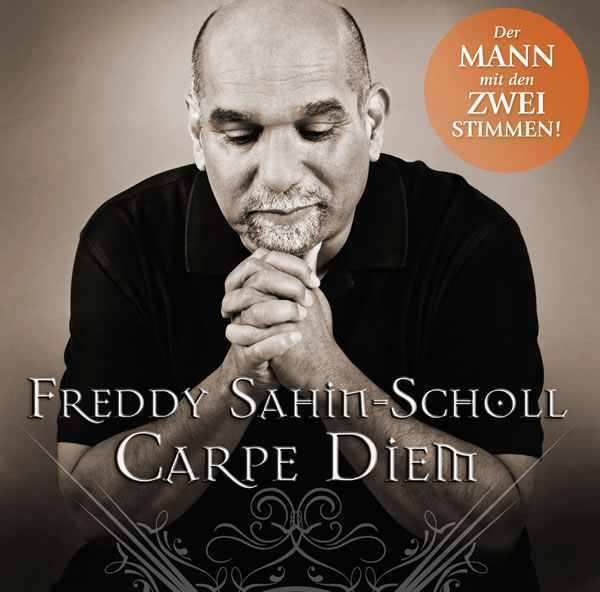 The fact that singer Freddy Sahin-Scholl's album CARPE DIEM hit the stores exactly two days after he won Das Supertalent (Germany's version of Britain's Got Talent) -- show finale on Saturday, CD in stores on Monday -- is only surprising to those who neither know about the mechanisms behind TV programs (of course, a musician is much more commercially viable than a woman who crushes melons with her gigantic breasts and all the other odd "talents" presented in the show) nor are aware of the fact that CARPE DIEM is simply a major-label re-release of an album Freddy Sahin-Scholl recorded in 1999 under the name "Galileo" and which had already been reissued in 2003 (by Edel). The only difference to the previous versions is the substitution of the title track against a "Version 2010" re-recording, and the addition of the Zucchero-penned song "My Love." With producer Edo Zanki (who had been active as a solo artist since the '70s and worked as Xavier Naidoo's producer), keyboardist and arranger Florian Sitzmann (member of Söhne Mannheims), and lyricist Cae Gauntt (of 4 Your Soul), Sahin-Scholl produces a showcase for his impressive ability to sing both soprano and baritone, often as a sort-of duet with himself. Most of the record mixes pseudo-classical orchestrations with pop balladry, but unfortunately, the bombastic arrangements and Sahin-Scholl's operatic vocals often make the songs (most of which were composed by the singer himself) feel overblown, as if constantly prodding you into finally feeling deeply moved. The record's best track, the disco-inspired "A Love Eternal" (written by Sitzmann), is a welcome change of pace with its subdued groove, and the music's theatricality feels more natural in this context. Fans of Sahin-Scholl's TV performances will surely enjoy the record, but anyone with a low tolerance for kitsch and pomp should stay far away. Still, since the music on this debut album is actually 11 years old, it will be interesting to hear what the 57-year-old vocalist's next move will be after his late breakthrough. This review was written for the All-Music Guide and first published on June 29, 2011. Neuer Kurzfilm mit Thomas Nash: Don Rudolfo!